The next best thing to living in Las Vegas is viewing sensational photographs of various Vegas landmarks. The full size 8.5 inches by 11 inches outstanding photographs leap off the page. Absolutely gorgeous, 2013 Calendar is sensational. Additional pages, each suitable for framing is a free bonus. FREE Shipping is included within the United States. Orders processed within 48-hours and shipped First Class mail. 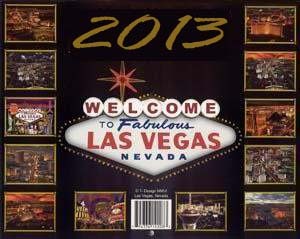 Regular retail price per calendar is $19.95.